It's been a few months, but finally the new madparts 1.2 release is available! Madparts is a functional electronics footprint editor with support for the Kicad and Eagle electronics Cad programs. 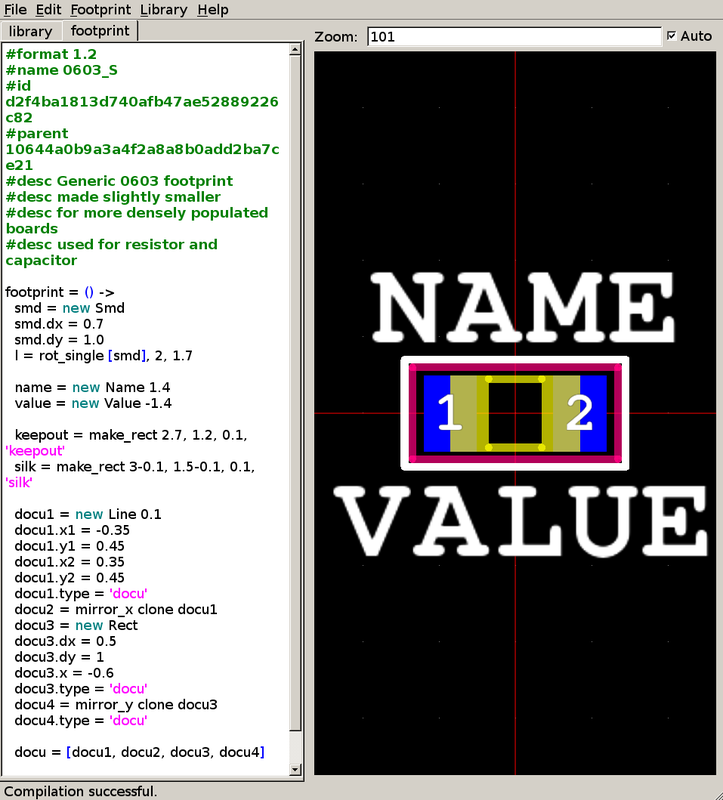 Finally full support for importing and exporting footprints from/to KiCad is now available. madparts supports both the old .mod file format and the newer .pretty/.kicad_mod file format. 1.2 adds support for arcs, partial circles, polygons and holes. Documentation is still sparse, but there is some more description of the supported features and code structures. Be sure to also have a look at my own private github repo of madparts footprints for more code examples. If you want to give it a try, head to the website at http://madparts.org/ for more information and downloads. If you find issues or have questions, don't hesitate to email me. With iPhônes liberated from the apple authentication chip by it, and Android also having added support in the latest Android 4.3, Bluetooth Low Energy (4.0) is starting to look more interesting. In this blog post I'm going to use a bluegiga BT111 based USB bluetooth dongle on Linux as a client and a TI CC2541 SensorTag as server. 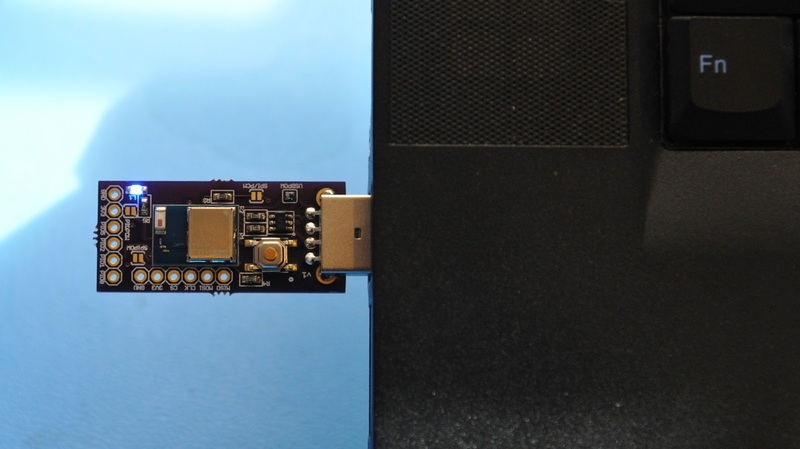 The SensorTag is a nice little bluetooth 4 example device provided by Texas Instruments. First step is put the device in the computer. As my laptop already has an existing bluetooth device build-in, the new one will enumerate as "hci1". This can be found out also by using hcitool. In this case the bluetooth mac address of the BT111 is 00:07:80:60:CE:4D. Normal bluetooth scanning is done with hcitool scan. Low Energy scanning is done with hcitool lescan. Make sure to press the button on the side of the SensorTag first to make it discoverable. Scanning is continuous to stop it with Ctrl-C. Low Energy devices require root access hence the sudo. I would expect being in the bluetooth group to be enough but for some reason it isn't. Now we know the address of the SensorTag: BC:6A:29:AC:2E:B4. In contrast with regular Bluetooth where there are a whole range of protocols, with Bluetooth Low Energy there is only one protocol at the top and it is GATT (Generic Attribute). The actual functionality of a device is implemented by means of attributes which can be read, written to or notification/indication enabled for, depending on the attribute. 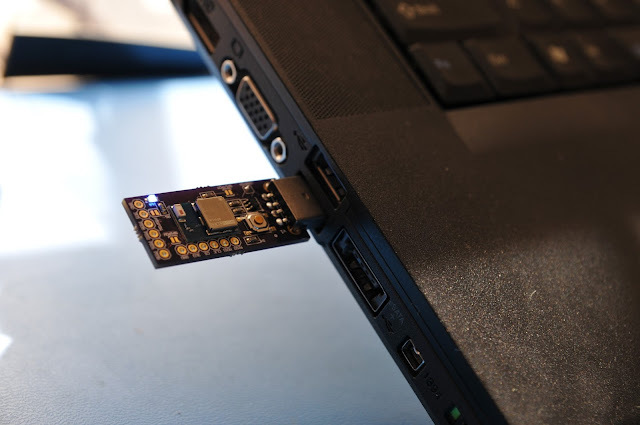 gatttool is a simple Linux tool that can be used to manipulate these attributes with a Bluetooth Low Energy device. 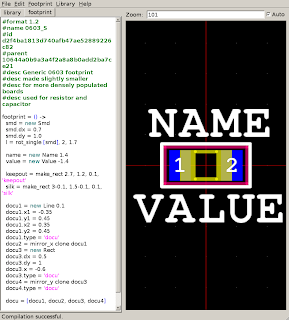 It can be used as a simple command line tool but I find it easier to use it in it's interactive mode. Let's enter the interactive mode. It returns us a prompt. Let's connect to the device. The CON indication tells us that the connection is established. Now the primary command can be used to find the primary services of the device. Attributes in GATT have uuids and handles. UUIDs (unique identifiers) define a certain type of entry, handles can be used to access a value. To make things more complicated there is also nesting involved. Certain UUIDs are defined in the standard and always have to be provided. Others can just be vendor specific and provide the actual data for the service. It's beyond the scope of this blog post to further look into how all that fits together. Luckily for us, the meaning of the sensortag attributes are defined on the user guide at http://processors.wiki.ti.com/index.php/SensorTag_User_Guide. As you can see on that page, there are 3 important handles for the humidity sensor, Data (0x38), DataNotification (0x39) and Config (0x3C). So far so good, but no useful data. We first need to enable the sensor. This is done by writing 1 in the Config handle. Let's retry reading the value now. That's more like it. Using the math provided on the website and a python script, this gives the temperature and the humidity. Instead of reading values it is also possible to use notifications. Finally let's disable the sensor and disconnect. Bluetooth Low Energy might look a bit different/strange at first but it is really quite nice! I'm certainly going to explore it further! 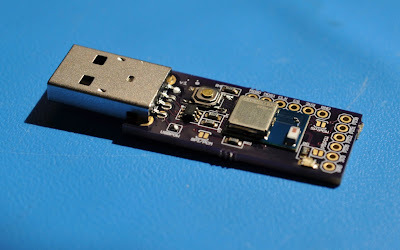 Don't forget to check out the very nice BT111 based USB dongle available for sale at my tindie store! The Atmel AVR atxmega*e5 is an interesting chip. However it is still rather new so getting it to work on my linux environment took some tinkering. Compiling requires a compiler that knows the CPU. In the previous post I just cheated and used a mostly compatible CPU. My Debian comes default with gcc 4.7.3 which does not support the new atxmega*e5 CPU's yet. Luckily someone already packaged the gcc 4.8.1 compiler source, so it was just a matter of recompiling Debian's gcc-avr package against the gcc 4.8.1 source package. If you don't feel like that using the atxmega*D4 as cpu type during compilation is doable. Besides the compiler, avr-libc also needs to be adapted. It is avr-libc that provides the io description headers for the CPU's. There is no avr-libc for linux yet that does this. Luckily Atmel's AVR Studio product also uses gcc internally, and they already support the atxmega*e5 CPU's. I took the files iox8e5.h, iox16e5.h and iox32e5.h from avr studio and copied these to /usr/lib/avr/include/avr/ . The code can be found on github, together with the files mentioned here for convenience. I have some extra atxmega32e5 breakout boards available. You can find them in my tindie store. In addition, the eagle schematic and board files are available on github as well. I'm still exploring this nice little microcontroller. Be sure to check back later on my blog for new adventures! The atxmega also supports using the calibrated internal 32kHz clock as auto-calibration reference for the 32Mhz internal oscillator, improving the accuracy. This code should do the trick. I'm not sure how I could actually verify it. Perhaps I can get the clock signal external and get it on a scope. The atxmega (I'm playing with an atxmega16e5) has multiple internal oscillators. By default it starts on the 2Mhz clock, which is actually an 8Mhz internal oscillator divided by 4. The following code switches to the 32Mhz internal oscillator. register definitions can be found in iox16e5.h. As I'm using an older avr-gcc I've looked in iox16d4.h instead, assuming that the base registers like for the clock are the same.